Provide comfort for the family of Robert McCabe with a meaningful gesture of sympathy. Robert Knight McCabe, 93, of Fayetteville, passed away Thursday morning, January 3. Born in Salamanca on April 4, 1925, he was the son of John and Doris McCabe. 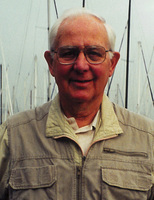 Robert served in the United States Navy during WWII as a 1st Class Radioman. He received an MBA from Syracuse University in 1951. Robert started as copy person at Barlow Advertising in Syracuse, rising to the position of Vice President. He then went to Crouse Hinds to be in charge of advertising before moving into heading up outdoor lighting. He retired in 1984. He enjoyed skiing, writing short stories, traveling and golf. Robert is predeceased by wife, Virginia R. McCabe in 1965; wife, Dzidra S. McCabe in 1985; and brother, Peter McCabe in 1979. Surviving are his wife, Janet N. McCabe; son, Michael Patrick (Marilyn) McCabe; step sisters, Suzanne Knapp, Lora Ordway and Judy Corvino; granddaughter, Siubhan (James) Bongiovanni; great-grandchildren, Marilla and Matthew Bongiovanni; and several nieces and nephews. Also by 11 stepchildren and 47 step grandchildren and 51 step great grandchildren from his marriage to Janet Nolan McCabe. Calling hours will be Thursday, April 4 from 10 to 11am at Immaculate Conception Church, Fayetteville. A Mass of Christian Burial will follow at 11am. Contributions in his memory may be made to the Alzheimer's Association, 441 West Kirkpatrick Street, Syracuse, NY 13204. I worked with Bob McCabe for a number of years at Crouse-Hinds Lighting Products Division located in Liverpool. Bob was a class act. Always the gentleman when we communicated and he was someone that I looked up to and respected. Bob was my boss at Crouse Hinds for many years. I had and still have great respect for him not only as a boss but as a caring individual. He was interested in the welfare of his associates and taught me much during our stay there.